Researchers map epigenetic pathways linked to cystic fibrosis disease severity. Mutation of one gene is all it takes to get cystic fibrosis (CF), but disease severity depends on many other genes and proteins. For the first time, researchers at the UNC School of Medicine have identified genetic pathways, or clusters of genes, that play major roles in why one person with CF might never experience the worse kinds of symptoms while another person will battle severe airway infection for a lifetime. The finding opens avenues of research toward new precision medicine treatments to lessen pulmonary symptoms and increase life expectancy for people with cystic fibrosis. The opensource study is published in the American Journal of Human Genetics. The team explain that currently there are drugs being developed to fix the function of the CFTR protein that is disrupted in cystic fibrosis, but even then, some patients will respond very well to therapy and some won’t. The team summise that it’s the genetic background, the pathways that they identified contain genes that likely interact with the main CFTR gene mutation. The current study found that when these pathways or groups of genes are highly expressed, CF patients have less severe symptoms. When these pathways are expressed in lower amounts, patients experience a more severe form of the disease and are more likely to be hospitalized. Now that the team have found these pathways, they plan to dig into the biology to see how specific genes within them influence disease severity. This could help the researchers not only to predict which patients will respond to a given therapy but it may also provide drug targets to lessen the severity of disease for all patients. The CFTR gene was discovered in 1989, and since then researchers have found about 1,800 different mutations in the CFTR gene that cause cystic fibrosis. There is a new drug that works very well to correct a mutation found in about 4 percent of CF patients. There is still no FDA approved drug to correct the mutation found in about 70 percent of patients (called the DF508 mutation), though a drug company has recently shown that a combination therapy of two new drugs modestly improved lung function in some CF patients. Still, this combination therapy may not work or wouldn’t work well enough for some patients, and the reason could be the complex interaction between the CFTR gene and the genetic pathways uncovered by the team. Over the past decade, the team have partnered with scientists from the United States and Canada to gather thousands of genetic and blood cell samples from CF patients. One of the research goals has been to identify genes and cellular proteins that often have subtle effects inside cells but that can produce dramatic differences in disease severity. Decades of research on protein functions has allowed genes to be grouped into pathways based on common biological roles. For this current study the researchers used gene expression data from the cells collected from 750 patients gathered over the past decade from 40 sites across the United States. They analyzed data on more than 4,000 pathways to find pathways that identified severe CF patients as compared to mild CF patients. They found significant genetic variation in only broad types of pathways, endomembrane pathways and HLA pathways. This finding was telling because endomembrane genes are responsible for transporting the DF508 protein from the cell nucleus to the cell membrane and for regulating the way that proteins such as CFTR are folded into the proper functioning form. The HLA genes are widely known to have roles in immune function; they’re important for protection against pathogens, such as Pseudomonas, the commonly seen bacteria that causes pneumonia in CF patients. The team plan to continue to evaluate the response of patients to new treatments and investigate if people who respond well have higher expression of these genetic pathways. If so, the researchers feel that they are really on the heels of precise medical approaches to treating CF patients at the level of their genes to lessen the severity of often debilitating symptoms. 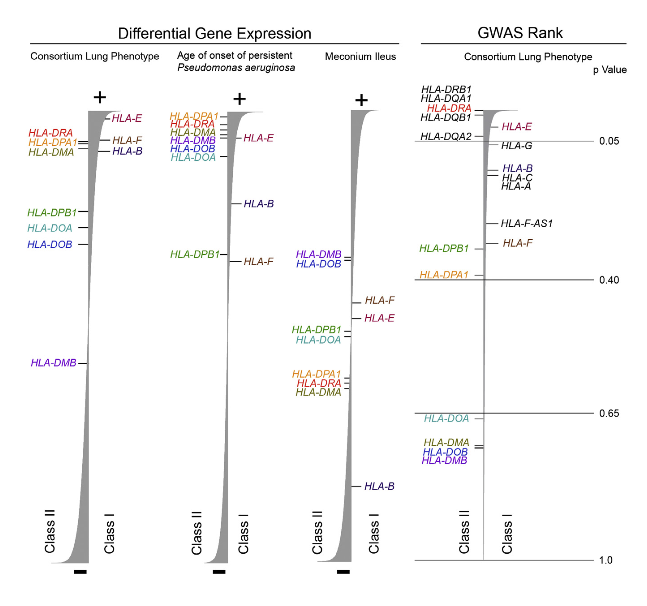 HLA Region Consistently Associated with Consortium Lung Phenotype and Age of Onset of Persistent P. aeruginosa Phenotype across Multiple Analyses, but not MI Phenotype Differential gene expression (left). HLA class I and II genes (listed on the right and left sides of each vertical bar, respectively) whose mean expression values are above the cutoff of expressed genes were ranked according to the association strength (t-statistic, negative [-;bottom] or positive [þ; top]; in the expression data (Consortium lung phenotype, n = 754; age of onset, n = 455; MI, n = 706). GWAS rank (right). HLA genes represented in the GWAS panel (n = 1,978) are depicted according to strength of association to Consortium lung phenotype. For GWAS rank, p values are provided as a reference to aid interpretation. The width of the vertical bar represents the relative strength of the association finding. Individual genes are color coded for convenience. GeneSetScan software was utilized to provide gene ranks for the HLA genes. Gene Expression in Transformed Lymphocytes Reveals Variation in Endomembrane and HLA Pathways Modifying Cystic Fibrosis Pulmonary Phenotypes. O’Neal et al 2015.